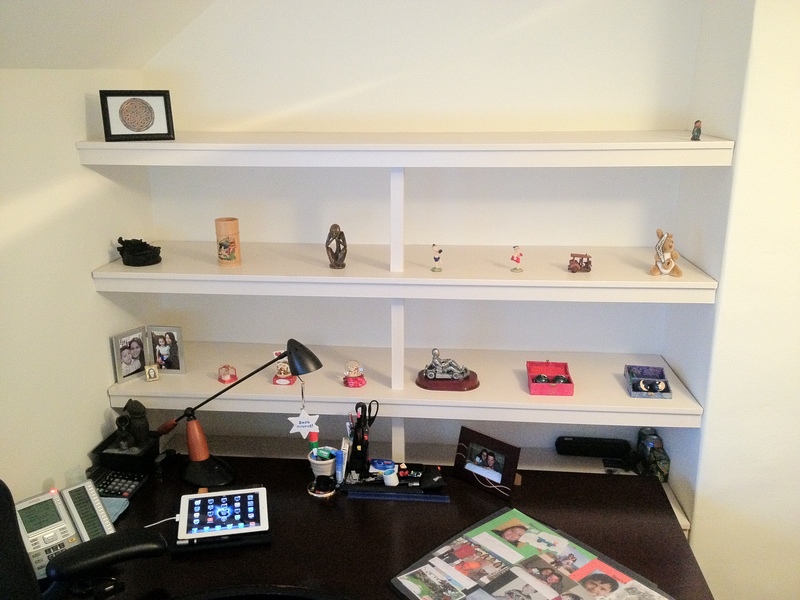 Where once there stood books, print-outs and folders there only stands a few ornaments and keepsakes. The paper is all gone. I have a couple of posts already on trying to go paperless and honestly it has taken a few years to get here and the final piece has been possible because of the iPad. After getting rid of filing cabinets in favour of electronic files on Sharepoint I also tried to go paperless with a tablet computer but it all seemed like too much work so paper still played a large part of both my personal and work life. However, with the addition of the iPad and the growing number of good apps and gadgets that accompany it I am glad to say that now I am truly paperless. All the papers that sat on my shelves mostly gathering dust are gone. Donated, recycled or shredded. Obviously some companies still send paper invoices by post but that is the exception rather than the rule now and mostly outside of my control. Companies that allow selection of paperless invoicing such as O2 I have selected that option. Evernote > at last I am starting to really use Evernote and using it to store and categorise relevant items on the web, documents and for work. Easily accessible from any of my computers or mobile devices. Adobe Createpdf > If I get a Powerpoint presentation, Word Document or Excel file that I want to read and mark up I quickly use CreatePDF to turn it into a pdf and then I open it in Studio Basic where I can use the excellent Studio i pen to mark up the document as I would if it were printed on a piece of paper. Scanner Pro > This little app is for the iPhone but works on the iPad2 OK. I can take a pic with the iPad2 with this app and ‘scan’ it straight as a pdf to Evernote, photo library, google docs or share it via email. No need to walk and look for a scanner or carry the paper around with me. Scan it and go. Flipboard > For consumption of my favourite web sites. News, tech, cars and more…..
Kindle > For all my books both personal and work. Any good books I had I have purchased the electronic version and recycled\donated the paper ones I had on the shelf. Dropbox > If needed for file access but I am favouring Evernote over this lately just for document storage. In my last post I mentioned Goodreader but while they have added features I feel it is clunky to use and navigate around. Evernote is a much slicker app. And for my pdfs and marking up as mentioned I now use Studio Basic. A few other apps have fallen by the wayside along the way. I am really enjoying my clutter free desk and note needing to carry books, magazines and print outs when ever I travel or even to and from work. Its takes some time to get used to and at the start it can be tempting to just print something out of habit but I would recommend it to all. Spend some time finding the apps you need to lighten your paper load and enjoy only carrying an iPad wherever you go. ← The Studio i for iPad. Is it the missing piece? Wow – great posting – I too strive to be like you and want to live a paperless lifestyle at work – it’s amazing how many files i drag back and forth from work to accomodate the paper I “may” need if I get into some work at home. I’m hoping The new iPad, and my subnotebook will be all I need moving forward. I’ll have to give a couple of those apps a go once I start my journey.